Photoshop templates are useful for creating holiday cards, marketing materials, and other graphics. Now that so many people have the Adobe CC Photography plan, lots of people have Photoshop, who may not be familiar with how to use it. I do almost all my editing in Lightroom, but even if you don’t edit in Photoshop, some basic Photoshop skills are helpful for designing graphics and other things that Lightroom doesn’t do. Photoshop templates can be purchased on a variety of web sites, including ones specific to photography, as well as etsy.com and other sites. But many templates don’t come with adequate instructions for how to use them, so I thought these instructions would be helpful. Like most things in Photoshop, there are several methods for adding your photos to templates, but I have found this method is the most reliable and easiest to learn. I have heard of so many people having issues when they use other methods, either because they couldn’t understand the instructions, or they have issues with blurry image or other problems. I have used this method for years without any trouble, so if you’ve struggled with this in the past, these instructions might make things easier for you. 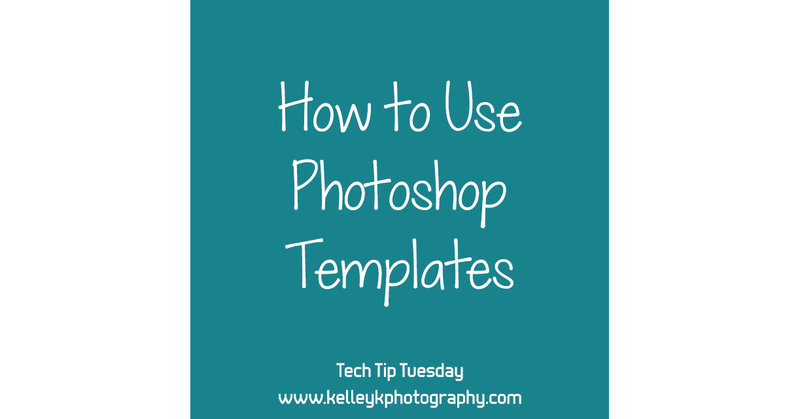 Many Photoshop templates involve some text and one or more shapes where a photo is supposed to go. Inserting and sizing the photos so they work in the template is where many people get frustrated. Placing photos in a template typically involves using a Photoshop feature called a clipping mask. The biggest thing you need to understand in order to use templates is how clipping masks work. Basically think of a clipping mask like a piece of paper with a shape cut out of it. When you use a clipping mask, you are putting that piece of paper on top of a photo. You can move the photo around below the piece of paper, and resize it as needed so that the part you want shows up. If needed, you can also resize or change the shape of the clipping mask (the opening in the piece of paper). Note that in this model, the photo is below the “paper”/mask layer. However, in the PS/PSE layers panel, the photo layer is shown above the mask layer, but with a small arrow next to it that indicates it is clipped “under” the mask. These instructions are written for the latest version of PS CC, but they should work for earlier versions of Photoshop as well, including Photoshop CS6. Install any fonts used in the template before opening it if possible. A good template designer will tell you the fonts used so you can download or purchase them. Open the template in Photoshop. You may get an error message about missing fonts not being available. Find the correct font or an alternate font from the drop-down list. Or click Don’t Resolve if you want to install and assign fonts later. Look at the Layers panel. You may see groups of layers (shown with file folder icons), such as Text, Elements, and Images. If you see this, expand the Images/Photos group, as this is where your photos will go. Go to File > Place Embedded to add your first photo. Select the picture you want, and then click Place. Move/resize the picture so that it appears roughly where you want it. Resize while holding down Shift and dragging a corner so you don’t mess up the proportions. In the Layers panel, drag the layer with the picture you added directly above the box that will serve as your mask layer. The mask layer is the opening you want to use as the “frame”. This is usually labeled something like “Image 1” or “Photo Mask 1”. In the layers panel, right-click the layer with your photo and select “Create Clipping Mask“. Repeat steps 5-10 for each photo to be used in the template. Now you can edit the text and other elements. Expand the text group if there is one. Double-click each text layer and edit the text for your needs. If you still need to assign the correct fonts, this is a good time to do that. Go to File > Save As to save the template as a PSD. When you are finished, you will want to save it as a JPG or PNG. There are two ways to do this. – To save it as a JPG or PNG for the web, go to File > Export > Export As to export the file as a JPG or PNG. – To save for print, go to File > Save As, select the file type of JPG. Make sure “ICC Profile: sRGB” is selected, and then click Save. Select quality of 10 when prompted, then click OK. These instructions are written for PSE 11 (the last version I used), but they should work with minor adjustments in other versions as well. Open the template in Photoshop Elements. If you see a message about Keeping Layers or Flattening the image, select Keep Layers. You may get an error message about missing fonts not being available. Click OK. You can fix this later. Open the Layers panel. You may see groups of layers (shown with file folder icons), such as Text, Elements, and Images. Photoshop Elements cannot work with layer groups, so you will either need someone with the full version of Photoshop to ungroup these for you, or you can search for and download an action for PSE to ungroup layers. There are many available online for free. Some templates even come with ungrouping actions. Go to File > Place add your first photo. With your photo layer selected, go to Layer > Create Clipping Mask. Repeat steps 6-11 for each photo to be used in the template. Now you can edit the text and other elements. Double-click each text layer and edit the text for your needs. If you still need to assign the correct fonts, this is a good time to do that. When you are finished, you will want to save the image as a JPG or PNG for printing or sharing online. There are two ways to do this. – To save it as a JPG or PNG for the web, go to File > Save for Web to export the file as a JPG or PNG.